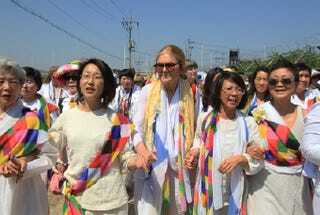 An international group of female peace activists crossed the heavily militarized border between North and South Korea earlier today. The group of about 30 members, called WomenCrossDMZ, included notable women like Gloria Steinem and Nobel Peace laureates, Leymah Gbowee and Mairead Maguire. ABC reports that hundreds of South Korean women greeted the activists and joined them to cross a heavily fortified bridge. Others, however, were less convinced by the group’s gesture.